Single crystal tin selenide (SnSe) is a perfect thermoelectric material and a semiconductor; it can instantly change waste heat to electrical energy or be used for cooling. When a team of researchers from Case Western Reserve University in Cleveland, Ohio, saw the graphene-like layered crystal structure of SnSe, they had one of those mystic "aha!" flashes. The team stated in the Journal of Applied Physics, from AIP Publishing, that they instantly knew this material had the potential to be fabricated in nanostructure forms. "Our lab has been working on two-dimensional semiconductors with layered structures similar to graphene," said Xuan Gao, an associate professor at Case Western. Nanomaterials with nanometer-scale dimensions -- such as grain size and thickness -- have promising thermoelectric properties. This motivated the team to grow nanometer-thick thin films and nanoflakes of SnSe to further explore its thermoelectric properties. The team’s work concentrates on the thermoelectric effect. They examine how the temperature variance in a material can make charge carriers -- electrons or holes -- to redistribute and produce a voltage across the material, changing thermal energy into electricity. Applying a voltage on a thermoelectric material can also lead to a temperature gradient, which means you can use thermoelectric materials for cooling. Generally, materials with a high figure of merit have high electrical conductivity, a high Seebeck coefficient - generated voltage per Kelvin of temperature difference within a material - and low thermal conductivity. A thermoelectric figure of merit, ZT, specifies how effectively a material changes thermal energy to electrical energy. The team's work concentrates on the power factor, which is proportional to ZT and specifies a material's ability to change energy, so they measured the power factor of the materials they created. To grow SnSe nanostructures, they made use of a chemical vapor deposition (CVD) process. They thermally evaporated a tin selenide powder source within an evacuated quartz tube. Tin and selenium atoms react on a mica or silicon growth wafer positioned in the low-temperature zone of the quartz tube. This makes SnSe nanoflakes to develop on the wafer’s surface. 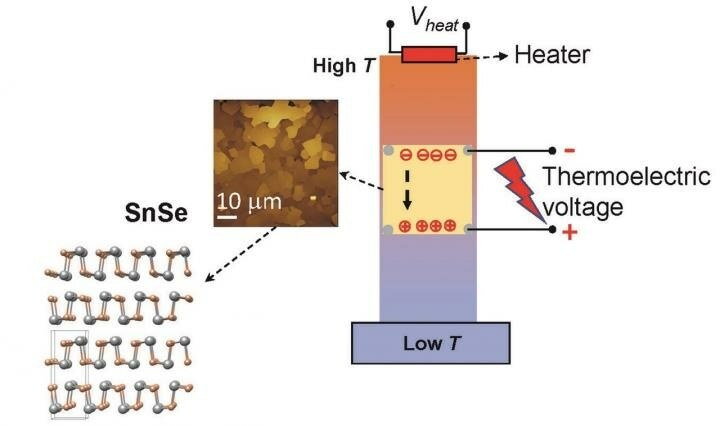 Incorporating a dopant element like silver to SnSe thin films during material synthesis can additionally enhance its thermoelectric properties. In the beginning, "the nanostructure SnSe thin films we fabricated had a power factor of only ~5 percent of that of single crystal SnSe at room temperature," said Shuhao Liu, an author on the paper. But, after trying a range of dopants to improve the material's power factor, they established that "silver was the most effective - resulting in a 300 percent power factor improvement compared to undoped samples,"
Liu said. "The silver-doped SnSe nanostructured thin film holds promise for a high figure of merit." Going forward, the researcher hopes that SnSe nanostructures and thin films may be beneficial for miniaturized, low-cost, and environmentally friendly thermoelectric and cooling instruments. What applications are currently being looked at with this. And what can be improved utilizing this currently?